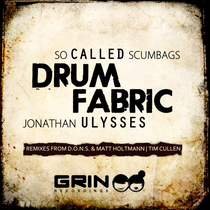 So Called Scumbags team up with Space Ibiza resident Jonathan Ulysses to showcase their brand new single 'Drum Fabric', backed up by remixes from Tim Cullen and D.O.N.S & Mat Holtmann. James Edwards & David Minns aka So Called Scumbags have had a jam packed summer so far with DJ sets at Pacha Ibiza, Cargo in London with 'Type', Glade Festival and a main stage set at the High Definition Festival sharing the arena with the likes of Fedde Le Grand, Mark Knight & Redlight. Their last release, 'Sundazed', on Grin Recordings was featured on compilations with Defected and Skint Records as well as gaining support from Annie Nightingale (BBC Radio 1) and Sister Bliss (Faithless). Jonathan Ulysses is enjoying his 10th year as a resident for the legendary We Love… parties at Space in Ibiza. Still finding the time to hit the studio, 2012 has seen him collaborate with artists like Prok & Fitch, Filthy Rich, Oliver Lang and Tim Cullen with releases on Toolroom Records, 303 Lovers & Hotfingers. Grin Recordings deliver a full on remix package with Ministry Of Sound resident Tim Cullen and German’s D.O.N.S. who teams up with Mat Holtmann for a percussive Balearic groover.